(2012.201.B0360.0091, Oklahoma Publishing Company Photography Collection, OHS). Suffragist Aloysius Larch-Miller was born on September 27, 1886, in Tennessee, the daughter of George and Ellen (Burke) Larch-Miller. Circa 1903 the family moved to Shawnee, Pottawatomie County, Oklahoma Territory. Aloysius Larch-Miller attended the Territorial Normal School (now University of Central Oklahoma) in Edmond. After graduating in 1908 she taught kindergarten for several years at Shawnee's Harrison School. She never married. During World War I Larch-Miller worked with the American Red Cross, serving as state secretary of the nursing department for the southwestern division. State Superintendent of Education Robert H. Wilson noticed her service and appointed her to supervise the teaching of Red Cross nursing at the state normal colleges. Larch-Miller worked as Pottawatomie County's chairperson and helped make the Third Liberty Loan a success. A Democrat, Larch-Miller served as the secretary of the Oklahoma State Suffrage Ratification Committee. She sacrificed her life in order to get Gov. James B. A. Robertson to call a special session of the Oklahoma Legislature to ratify the Nineteenth Amendment to the United States Constitution. The Seventh Legislature had adjourned without voting on ratification. Learning that Oklahoma Atty. Gen. S. P. Freeling would be at the Pottawatomie County Democratic Convention to speak in opposition of calling a special session, Larch-Miller attended the meeting against doctor's orders. Her oratorical abilities exceeded Freeling's, and she was able to obtain a vote of two to one to call a special session, with legislators paying their own expenses. However, she contracted pneumonia in addition to the influenza and died two days later on February 2, 1920. Twenty-six days after her death the Oklahoma legislature met in special session and ratified the Nineteenth Amendment. Following her death on February 2, 1920, Judge George Carl Abernathy of Shawnee made a motion that a resolution of sympathy be passed for Larch-Miller as "'a martyr to woman suffrage.'" Governor Robertson ordered the state flag to be flown at half-mast, and Freeling was among many state dignitaries who attended her funeral. She was buried at the Calvary Cemetery in Shawnee. Described as a gifted orator, having abundant energy and impressive ideas as well as charm, Larch-Miller has a memorial to honor her. Citizens and children raised funds to build the Larch-Miller Park in Shawnee. 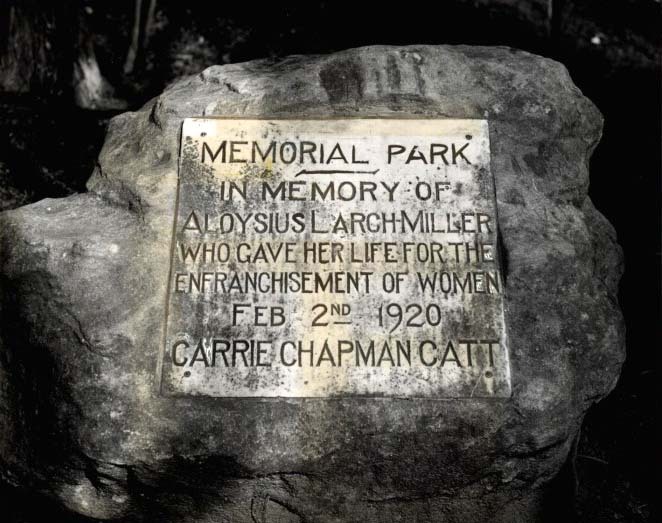 She posthumously received a certificate from the National American Woman Suffrage Association (NAWSA) signed by president Carrie Chapman Catt and dated February 16, 1920, and stating that Larch-Miller was "entitled to a place on the Honor Roll of the brave army of men and women" who worked for woman's suffrage. In 1982 in recognition of her suffrage work Larch-Miller was posthumously inducted into the first Oklahoma Woman's Hall of Fame. Ada (Oklahoma) Weekly News, 5 February 1920. "Aloysius Larch-Miller," Vertical File, Oklahoma Room, Oklahoma Department of Libraries, Oklahoma City. "Aloysius Larch-Miller," Vertical File, Research Division, Oklahoma Historical Society, Oklahoma City. Drumright (Oklahoma) Evening Derrick, 3 February 1920. Edmond (Oklahoma) Sun, 28 May 1908. Eleanor Flexnor and Ellen Fitzpatrick, Century of Struggle: The Woman's Rights Movement in the United States (Cambridge, Mass. : Harvard University Press, 1996). Guthrie (Oklahoma) Daily Leader, 6 August 1918. Ida Husted Harper, ed., The History of Woman Suffrage, Vol. 5, 1900–1920 (N.Y.: National American Woman Suffrage Association, 1922). New York Tribune, 19 August 1920. Oklahoma City (Oklahoma) Times, 12 April 1919 and 3 February 1920. The Oklahoma Teacher 2:7 (March 1921). Shawnee (Oklahoma) News, 3 September 1907. Tulsa (Oklahoma) Daily World, 6 February 1920. The Woman Citizen 4:31 (February 21, 1920). Linda D. Wilson, "Larch-Miller, Aloysius," The Encyclopedia of Oklahoma History and Culture, https://www.okhistory.org/publications/enc/entry.php?entry=LA040.